(Plant & Pot Size: 1 feet to 2.5 feets. Pot Size: 5 inch dia & 5 inchs height.) Picture is only for reffrence purpose original may be different. Karaunda (Carissa carandas) is a hardy, evergreen, spiny and indigenous shrub widely grown India. It is also found wild in the states of Bihar, West Bengal and many parts of South India. It is grown commonly as a hedge plant. Regular plantations of Karonda are very common in Varanasi district of Uttar Pradesh. Fruits, sour and astringent in taste, are a very rich source of iron also containing good amount of vitamin C. Karaunda is very useful in curing anemia. 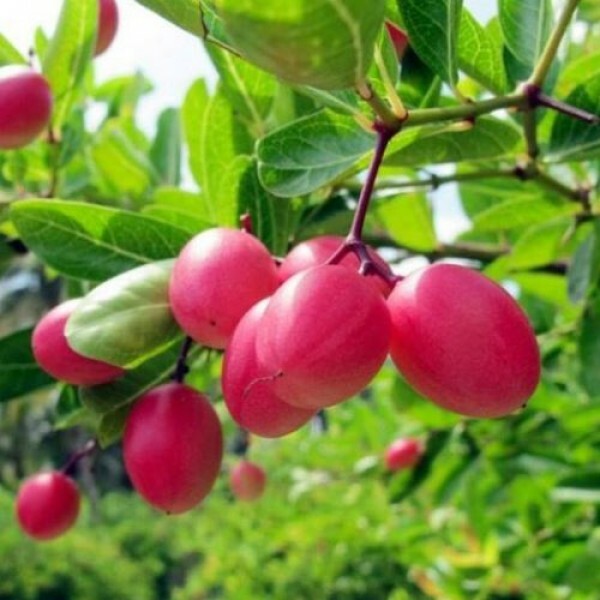 The fruits have antiscorbutic properties also. Climate and soil: Since Karaunda is a very hardly and drought tolerant plant, it thrives well throughout the tropical and subtropical climates. Heavy rainfall and waterlogged conditions are not desirable. It can be grown on a wide range of soils including saline and sodic soils. Propagation of karaunda: Karaunda is commonly grown from seeds. Vegetative methods—air- layering and stem (hard wood) cuttings are feasible but not very common. Fresh seeds are sown in nursery during august –September. One- year old seedlings are transplanted. Air- layering is very successful in karaunda. It can be performed in the beginning of the monsoon. Rooted layers can be separated 3 months after layering. Regular plantations of Karonda can be trained on single or double stem. Therefore additional unwanted shoots or laterals are removed from time-to-time to give the plant desired shape. Bearing plants of normal height do not require any pruning. Suckers arising from ground and diseased dried twigs should be removed. Manuring and fertilization for Karaunda: Karaunda plants grown as protective hedge are hardly manured or fertilized. Manuring, however, is beneficial. Otherwise its plants slowly get exhausted after taking 2 crops and start showing symptoms of die back. Therefore, 10-15 kg well-rotten farmyard manure or compost/plant should be applied before flowering.